After the craziness of La Paz we were looking forward to getting back to nature & exploring Lake Titicaca! 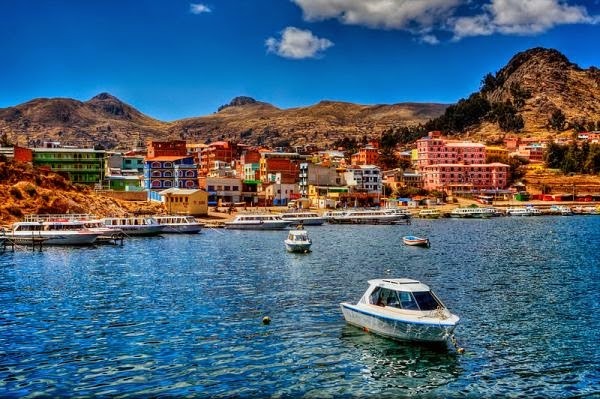 We set off from scenic, colourful Copacabana to explore Isla del Sol, a tranquil, breathtakingly beautiful island located in the southern part of Lake Titicaca in Bolivia. Whilst Isla del Sol has are no paved roads or cars there is an extensive network of walking trails and we spent a day walking from the north of the island to the south. It was our first experience hiking at altitude and there also isn’t much shade so pack plenty of water, food and sunscreen as the sun is very strong! There are over 80 ruins on the island and the Incas believe that the sun god was born here! It’s an incredible island with the most beautiful, unique scenery and well worth a visit when in South America. Rewind a few days to Copacabana, one of our first stops on our Intrepid/Dragoman La Paz to Lima tour. Copacabana is a small colourful town located on the shores of Lake Titicaca. We stayed for a few nights and used it as our launch point to visit Isla del Sol as you saw above. Lake Titicaca is the world’s largest, high altitude lake and it’s not difficult to understand how the Inca’s give credit to Lake Titicaca with the birth of their incredible civilisation. The drive from La Paz to Copacabana was a beautiful and scenic journey as we hugged the shore of Lake Titicaca. Our bus truck even took it’s own ferry across the river! Our last night in Copacabana we sat by the shore of the lake and watched the sunset. It was one of the best sunsets I’ve seen in my travels & I sadly only had my phone so the photos do not give it justice! Have you been to South America? What was your favourite parts?